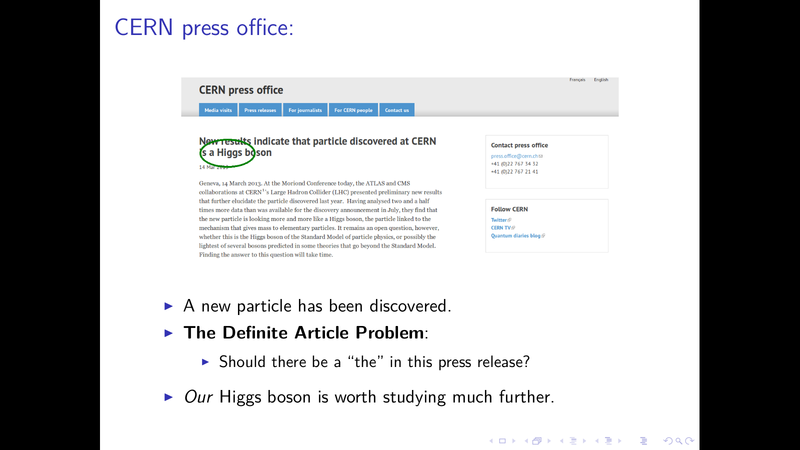 Have we discovered “a” Higgs boson or “the” Higgs boson? 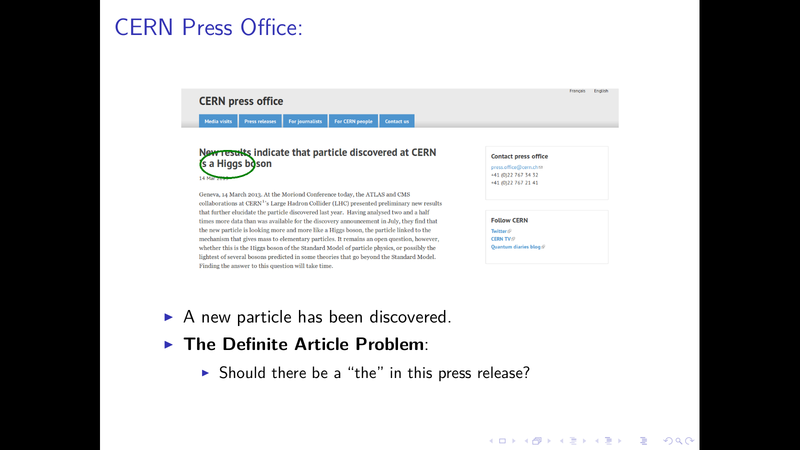 Before I touch upon that problem, I want to explain about why the Higgs boson is important. In particular, I want to talk about the Sun! Yes, the Sun. 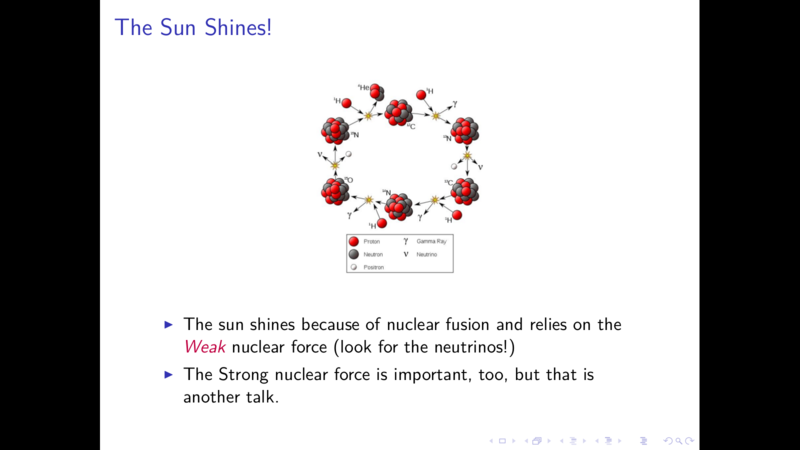 The Higgs Boson and Electroweak Symmetry Breaking is Important because the Sun Shines. Okay, there is no way to avoid this: I really like the sun. It shines. It keeps the planet warm. There is liquid water on Earth, and some very tasty plants too. 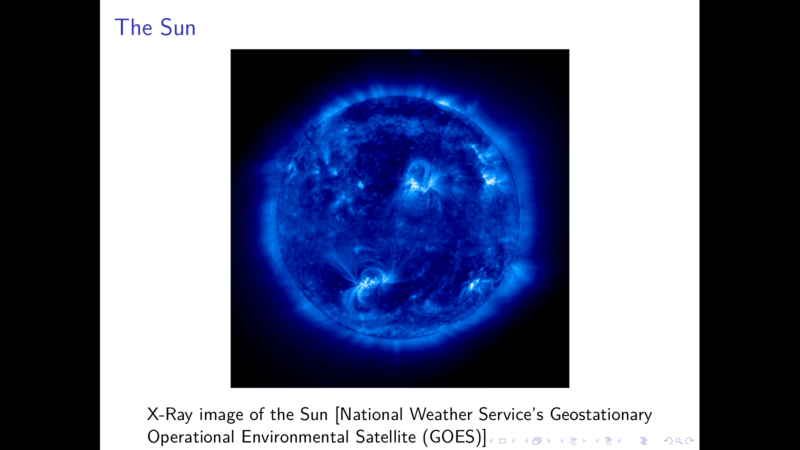 At the heart of the Sun is a ranging nuclear furnace and involves two types of processes: (1) those that involve the Strong nuclear force and (2) those that involve the Weak nuclear force (look for the neutrinos!). The two types of processes work together in a solar relay race to complete a circuit, only to do it over and over again for billions of years. And just like a real relay race, the speed at which the circuit is finished is set by the slowest member. In this case, the Weak force is the limiting factor and considerably slows down the rate at which the sun could theoretically operate. If we make the Weak force stronger, then the Sun would shine more brightly. Conversely, if we make the Weak force even weaker, the Sun would be dimmer. 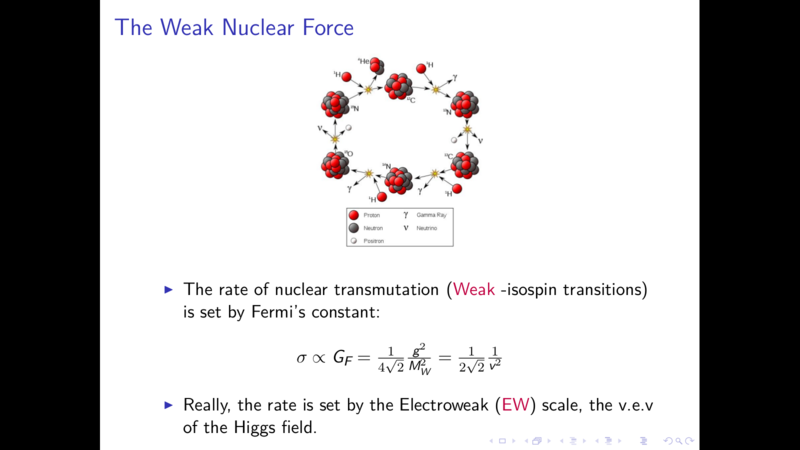 From studying the decays of radioactive substances, we have learned that the rate of Weak nuclear processes is set by a physical constant called Fermi’s Constant. Fermi’s Constant is represented by symbol GF. From study the Higgs boson and the Higgs Mechanism, we have learned that Fermi’s Constant is literally just another constant, v, in disguise. This second physical constant (v) is called the Higgs “vacuum expectation value” , or “vev” for short, and is the amount of energy the Higgs field has at all times relative to the vacuum. 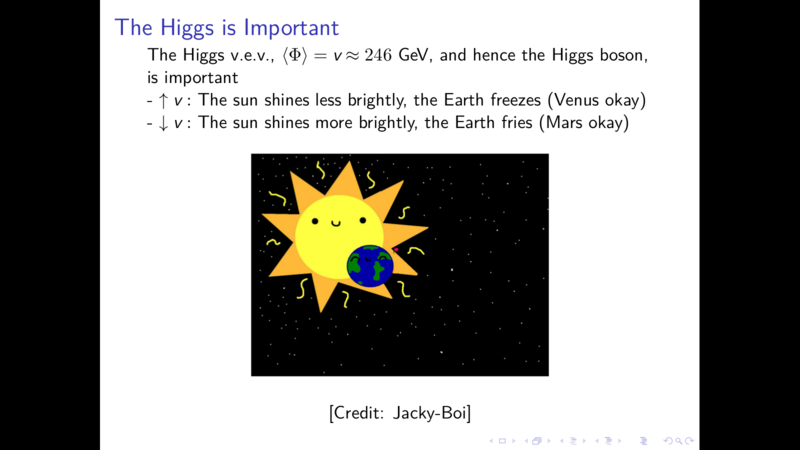 The Higgs vev is responsible for some other things, too. It is a source of energy from which all elementary particles can draw. Through the Higgs Mechanism, the Higgs field provides mass to all elementary particles and massive bosons. One would think that for such an important particle we would have a firm theoretical understanding it, but we do not. 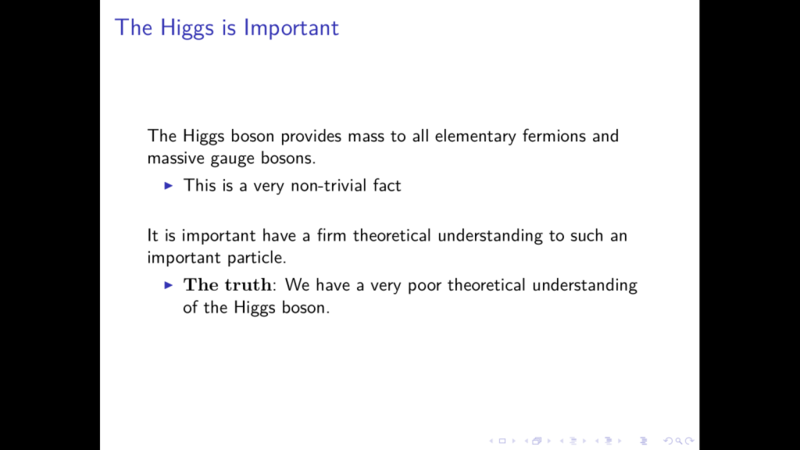 We have a very poor theoretical understanding of the Higgs boson. Among other things, according to our current understanding of the Higgs boson, the particle should be much heavier than what we have measured. 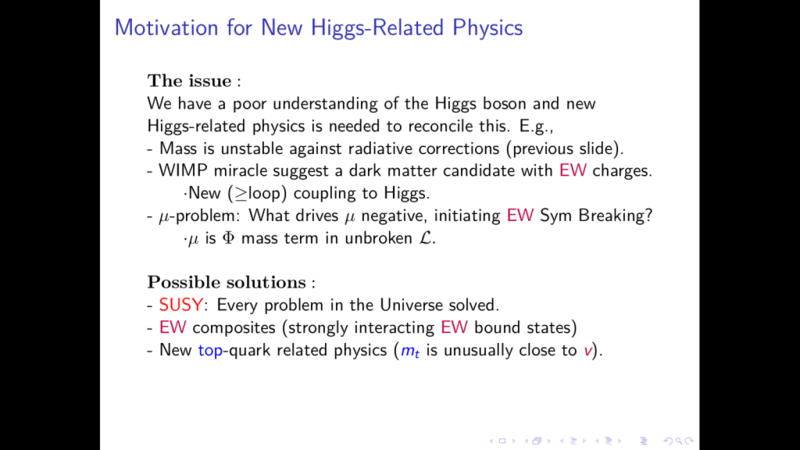 There are lots of possible solutions to the problems and theoretical inconsistencies we have discovered relating to the Standard Model Higgs boson. Many of these ideas hypothesize the existence of other Higgs bosons or particles that would interact like the Higgs boson. There are also scenarios where Higgses have identity crises: the Higgs boson we have observed could be a quantum mechanical combination (superposition) of several Higgs bosons. I do not know if there are additional Higgses. Truthfully, there are many attractive proposals that require upping the number Higgs bosons. What I do know is that our Higgs boson is interesting and merits much further studying. PS In case anyone is wondering, yes, I did take screen shots from previous talks and turn them into a DQ post.